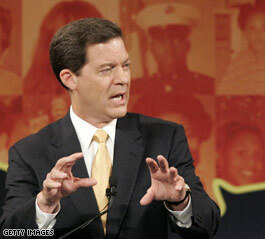 Brownback will make a 'major announcement,' CNN has learned. WASHINGTON (CNN) - Republican presidential hopeful Sam Brownback, dogged by low poll numbers and a poor fundraising showing last quarter, has decided to abandon his bid for the White House, people close to the senator tell the Associated Press. Meanwhile, a campaign source tells CNN's Chief National Correspondent John King that all scheduling has been put on hold pending a "major announcement" from the Kansas Republican. Fred Thompson can at least fog a mirror. Good. Now there are only two serious candidates who don't believe in evolution. So I assume that we shall once again be represented by two US senators in Washington. Finally. Who will people who believe the earth is flat and that rain is Jesus' tears vote for now? I don't know, how much money does he need? I saw Mike Gravel speak yesterday at my school, USF, and he doesn't have much cash. That being said, though, if a candidate doesn't have a prayer of winning, maybe it's best for them to drop out. This is hard for me, as a Coloradan, to say, but I hope Tancredo follows Brownback out of the race. I hope all other Republicans fold afterwards. He should endorse Ron Paul now. More of the self serving hypocrites show setp aside, and do something more productive for America, than blowing millions on fruitless campaigns. I am not a professional political advisor, but here's my suggestion. You are from Kansas, nobody knows you. Go back to the Senate, make a huge name for yourself. Try again in 2016 when Hillary leaves office. Just curious...anyone else notice that Senator Brownback looks EXACTLY like that comedian who used to impersonate Ronald Reagan? His name was Jim something-or-other. Anyway, goodbye to you, Senator Brownback; your consolation prize is to sink back into the anonymity from which you oozed.